Looking for a sleek alternative to wood? Our plastic bottom hangers are not only durable but will save space due to their flat design. Our"delicates" bottom hangers are an excellent choice for all fine fabrics. Dhaval Plastics can develop any kind of Plastic Molding Hanger Or Article on Demand. 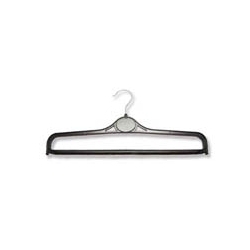 Our Hangers are of Export Quality and have great strength. We are already having 400+ Molds of Plastic Hangers. We also have our own Tool Room In house in the Daman Factory. Which helps us to cope of with innovative products of our valued customers & make the necessary changes & Repairing works in the Mold in Least time & helps us to Increase the Production. Welcome to the thriving world of Dhaval Plastics. Dhaval Plastics Is AN ISO 9001:2000 CERTIFIED COMPANY DHAVAL PLASTICS has been one of the Leading Manufacturer of Plastic Hangers since last 20 years & has also enjoyed its reputation in the market. Shri Shailesh P.Kapasi is the real founder & Proprietor Of the Company. He Has Dedicated 25+ years of Vast Industrial Knowledge & Practical Experience In Reverse Paramedical Growth Of the Company. The Complete Market Knowledge right from Buying Moldovan Machines, Raw Materials & Making Molds to Finished Goods, marketing Knowledge, Reputation & Experience has always given the Positive & Upward Push to the Company. However, we also Export the Hangers Directly to any Part Of The WORLD. Welcome to the thriving world of Dhaval Plastics. Dhaval Plastics Is AN ISO 9001:2000 CERTIFIED COMPANY DHAVAL PLASTICS has been one of the Leading Manufacturer of Plastic Hangers since last 20 years & has also enjoyed its reputation in the market. Shri Shailesh P.Kapasi is the real founder & Proprietor Of the Company. He Has Dedicated 25+ years of Vast Industrial Knowledge & Practical Experience In Reverse Paramedical Growth Of the Company. The Complete Market Knowledge right from Buying Moldng Machines, Raw Materials & Making Molds to Finished Goods, marketing Knowledge, Reputation & Experience has always given the Positive & Upward Push to the Company. However, we also Export the Hangers Directly to any Part Of The WORLD We have shown our expertise in manufacturing and supplying fabulous range of Plastic Hangers and plastic clothes hangers that can be availed in customized designs too. We procure excellent quality raw material to shape up our products that fulfill the expectations of clients in mind.